Nothing like a soothing soak in a hot spring after a long day on the trail. For the High Sierra visitor who wants to take a hike and “take the cure” in the same day, Grover Hot Springs State Park, located a bit south of Lake Tahoe, is the perfect destination. Don’t expect a deluxe Euro-resort; Grover Hot Springs offers your basic soak, nothing more, nothing less. Bathers can sit in one hot pool (102 to 105 degrees) fed by six mineral springs, and one cool pool. The two pools and the changing rooms are the extent of the state park facilities. No, it’s not the concrete pools, surrounded by a wooden fence (the effect is rather like a backyard swimming pool installed in the 1950s) but the setting that’s inspiring at Grover Hot Springs. 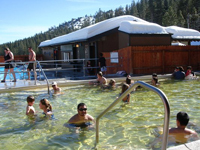 Tucked in Hot Springs Valley, surrounded on three sides by Sierra Nevada peaks, Grover Hot Springs offers a soak in a setting as soothing as its waters. The granite peaks, including 10,023-foot Hawkins Peak to the northwest and 9,419-foot Markleeville Peak to the southwest, form an inspiring backdrop to an area that’s been attracting visitors since the 1850s. At the park, true hot springs aﬁcionados can read up on the exact mineral content of Grover Hot Springs and ﬁnd out just how many grams per gallon of magnesium carbonate and sodium sulfate the waters hold. Most bathers, even those without any interest in chemistry, will be happy to know that Grover, unlike most other hot springs, contains almost none of that nose-wrinkling sulphur. Most visitors come to this out-of-the way park for the waters, not the walking. Too bad, because the state park and surrounding national forest boast some inspiring footpaths. Easy family hikes include a nature trail called Transition Walk that loops around the park’s alpine meadow and a three mile round trip walk to a waterfall on Hot Springs Creek. A more ambitious jaunt is the hike to Burnside Lake located in the adjacent Toiyabe National Forest. Burnside Trail crosses the state park, then ascends through a pine forest to the alpine lake.